This post looks at the cost of Kotlin properties. Since my last post I’ve set up a Raspberry Pi booting to Bash to run the benchmarks - the result is a lot less noisy measurements and so better fidelity. John Nolan continues to be the statistical brains behind the Hamkrest matchers used to show the relationships between results. so that we can benchmark field access, getter access to that field, and calling a method that returns a constant. val methodProperty get() = "hello"
It looks like everything is the same speed except for field_property. Let’s ask the stats on all the test results that I’ve collected so far. This first assertion says that we can’t see any statistical difference between accessing the Java field directly, and calling the getter. That’s a surprise to me, as the former is a field access and the latter a method call and the same field access. I suppose that HotSpot has worked its magic (you may recall that we run these benchmarks many times and only start measuring after HotSpot has had time to do so) inlining the getter so that the running code is effectively the same. 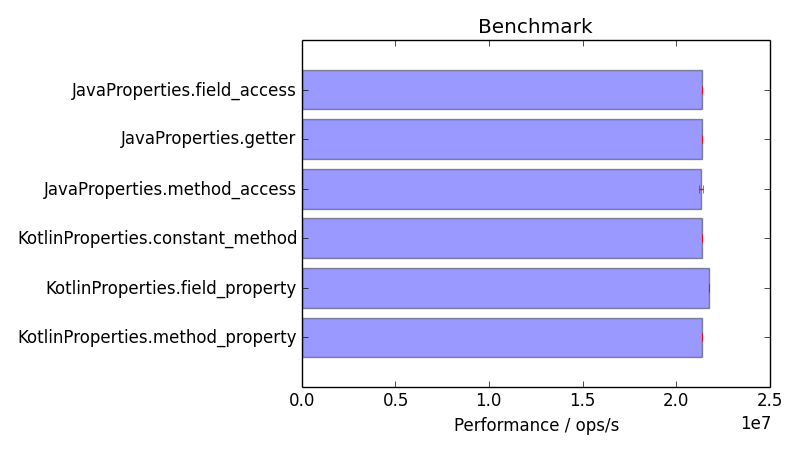 shows that calling a method that returns a constant is faster than accessing a field directly. Again that’s a little surprising, but the size of the effect is very small, between 0.02 - 0.05%. Accessing a Kotlin method property (where we define a get() operation for the property) is unsurprisingly indistinguishable from calling a method, as that is what it is. That just leaves the outlier - the standard Kotlin property with a backing field. This turns out to be statistically significantly faster than all the other access methods by between 1.5 and 2 %. Now I really don’t understand this result. I’ve seen it visually in all the Raspberry Pi test runs and those assertions pass on the amalgam of over 5000 benchmark samples, so it isn’t a statistical aberration, but I can’t see how it can be. I can believe that HotSpot magic and speculative execution could boost the Kotlin property to the same speed as direct field access, but I don’t see how it can be reliably faster. private final Ljava/lang/String; fieldProperty = "hello"
That final probably allows HotSpot to more aggressively inline the value of the variable, safe in the knowledge that no-one can (should) change it. So it’s time to fire up the Raspi and run some more benchmarks to test this hypothesis. 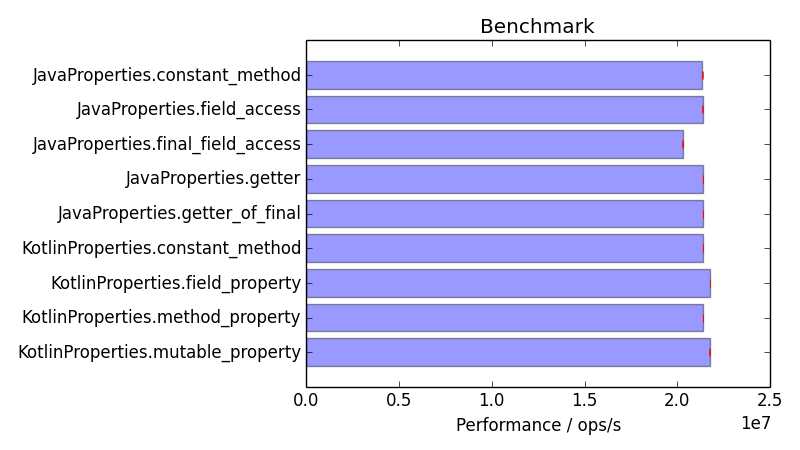 Against expectations, the Kotlin mutable property seems no slower than the immutable property, and the Java final field access is significantly slower than non-final field access. We get a clue why the Java final field is slower when we examine the bytecode. The value has been inlined, but only after a nugatory(?) call to get the class of the object that it came from. I really don’t understand this at all, but if you do, you could answer this Stack Overflow question. Well it turns out that the inlining of non-static final primitive and string fields is required by the Java Language Specification, and that getClass call is a cheap null check to make sure that it can’t resolve if the referenced object is null. Given the confusion, and that, for me at least, this is the slower option, I’m not sure that was a good idea. And I still don’t know why the Kotlin property access is significantly faster than all other options. Let’s hope someone at KotlinConf can put me out of my misery.